InSitges apartments provide everything you need for a pleasant stay, so you just need to bring your will to enjoy your holidays. All rooms contain cupboards with drawers. 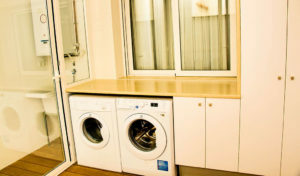 In the apartments you will find bed linen and towels for four people. In case you have guests, sheets and blankets will provided for the sofa bed if requested. 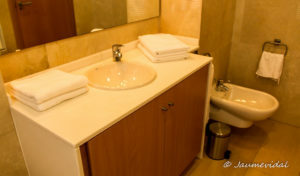 Please note that the cleaning service and change of towels and bed lines takes place once a week. Ribera’s Apartments: 1 bedroom suite, with airconditioning, 1 double room with bunk beds, 1 bathroom, 1 double room with sea views, sofa-bed in the living room. 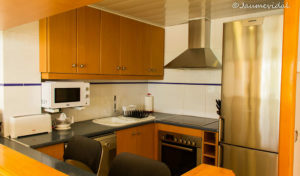 Large dining room with kitchenette and balcony overlooking the sea. Ribera’s Beach – Penthouse: 1 bedroom suite with air conditioning, 1 double bedroom with 2 beds, 1 bathroom, living room with fully equipped kitchenette, 1 sofa-bed and terrace with sea views. 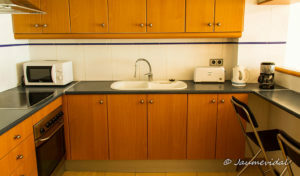 Sant Sebastià Standard: 1 bed room with a large double bed, 1 bedroom with a bunk bed, and 1 bathroom with a bath and a shower. 1 double sofa bed in the living-room. Sant Sebastià Duplex: First floor, 1 bedroom with a large double bed, 1 bedroom with a bunk bed and 1 bathroom with a shower. 1 single sofa bed in the living-room. Second floor, 1 suite with a double bed, 1 bathroom, and two terrace-solarium. Center apartment: 1 double suite with bathroom, 1 bedroom with bunk beds, 1 full bathroom and dining room with fully equipped kitchenette.